MedAngel is the guardian angel of your medications. It combines a medical grade wireless thermometer with an intuitive app to help you protect your medications. Many prescription drugs are temperature ­sensitive, and lose their effectiveness if frozen or exposed to heat. The thermometer is placed with your medications, continuously measures temperature and communicates with your phone. The app alerts you whenever temperatures approach or exceed the safe range. With MedAngel you don’t need to worry about your medications ever again. 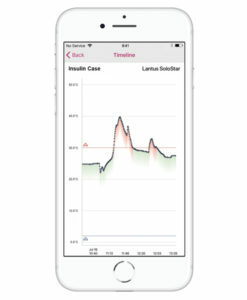 This offer gives you two MedAngel ONE devices at a 20% discount. 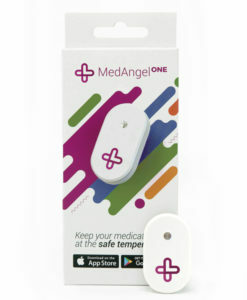 MedAngel ONE is the perfect companion for your medications. 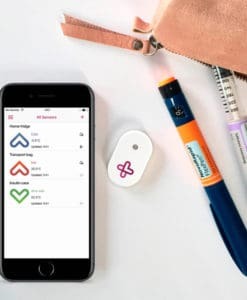 It’s easy-to-use, compact, and connects to your smartphone, allowing you to store and transport your medications at the right temperature. Continuous monitoring takes the doubt away. No more guessing if your medication has gone bad. 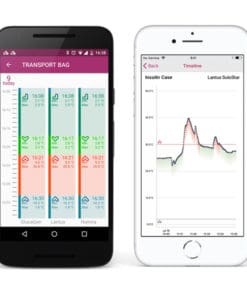 MedAngel always shows you the exact temperature, at home, on the go or while travelling. At one glance, you can see if everything is ok or not: a green heart means all is well, red or blue hearts show it is too hot or cold. A fridge left open or a hot summer day? 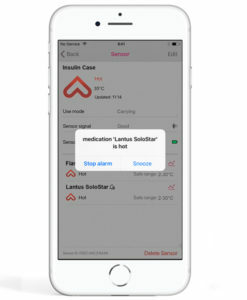 MedAngel triggers an alarm if it gets critical. The app warns you whenever temperature approaches or exceeds safe range limits. This can be a simple reminder to check the fridge door or to move a bag out of the sun. A small action can prevent great damage. Simply choose your medication in the app. Safe temperature ranges are automatically set up. Select long term storage or short term carrying mode to get the right safe ranges for your use. All insulins and Epipens, as well as a wide range of biologics, hormones and other injectables are supported. Live your life fully and don’t worry about your medications! Travel the world, explore the outdoors and enjoy quality time with your loved ones without the hassle. Has it gone bad? Is it still OK to use? So many variables come into play in your health: Food, physical activity, mood, even weather – don’t let your medicine be one of them! MedAngel helps you to have the full picture about your medications. The MedAngel ONE sensor is powered by a standard coin cell battery which lasts for 8-9 months. Simply replace it yourself and make your sensor last for years. The app will give you a notification when you need to do that. 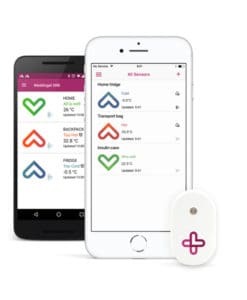 Smart Alerts – Every time the temperature approaches or exceeds the safe levels you get intuitive alerts and notifications. Comprehensive history – Check if your medications were properly stored the previous days in timeline view. Waterproof design – MedAngel ONE can be used in refrigerators and in medical coolbags.